In the winter months, it can feel like the streets are a sea of anonymous, ubiquitous, black (or a military-inspired olive) puffer coats, thick fur-trimmed hoods bouncing along the sleet-slicked streets; Magritte would have had a field day, really, The Son of Man’s overcoat and bowler hat replaced by Sorels, Canada Goose parka, and knit beanie, the large green apple switched out for a large gleaming iPhone . 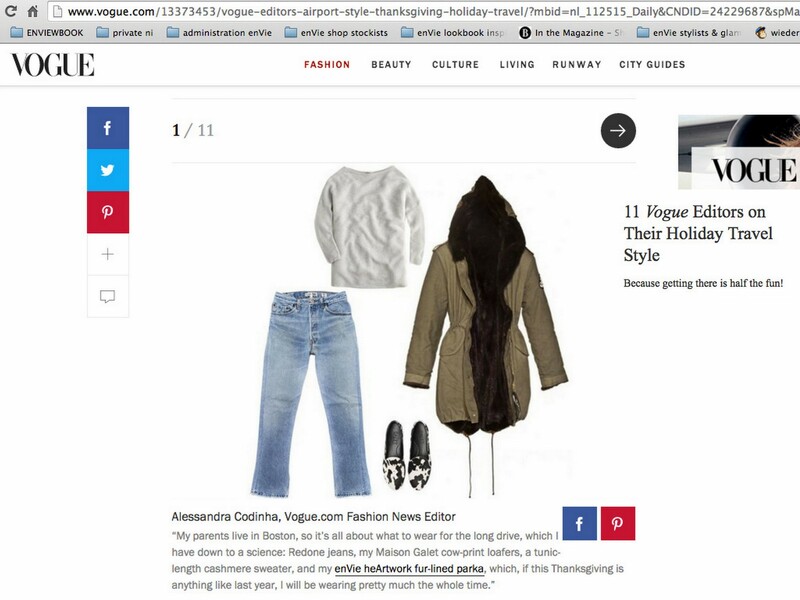 . . and while I have never quite fallen in line when it comes to outerwear that “blends in,” well, a certain climate makes you put the statement coats away. And that climate is all around us on the Eastern seaboard, my friends. That climate is now. So what’s a girl to do? Well, while casting around for some sort of wrapper that would keep me warm and dry and still somewhat stylishly fulfilled while not exactly matching those worn by everyone else who I know or see several times a day in the Condé Nast lobby, fate, or kismet, or some sort of fashion karma pulled one into my path. Quite literally: I basically tripped over it. I was at my local dog park, bonding with my fellow puppy parents over how completely insane we are to have dogs in this, of all cities, in this, of all seasons, but of course we are and we will and we do—and it’s really quite the scene, I have to tell you, it’s a very bonding experience, I’m positively social queen of the dog park! Ask anyone—when the owner of a six-month-old black Lab puppy (and there is very little cuter than that, except my own dog at that age but that’s neither here nor there) started enthusing about her Roomba vacuum as my dog began to chase hers in concentric circles of increasing size. The iRobot Roomba is apparently the only thing to combat dog hair that doesn’t require live-in help, or losing your mind. But it wasn’t the Roomba that peaked my interest (that’s actually not strictly true, I did ask for one for Christmas, I love it), it was her coat. 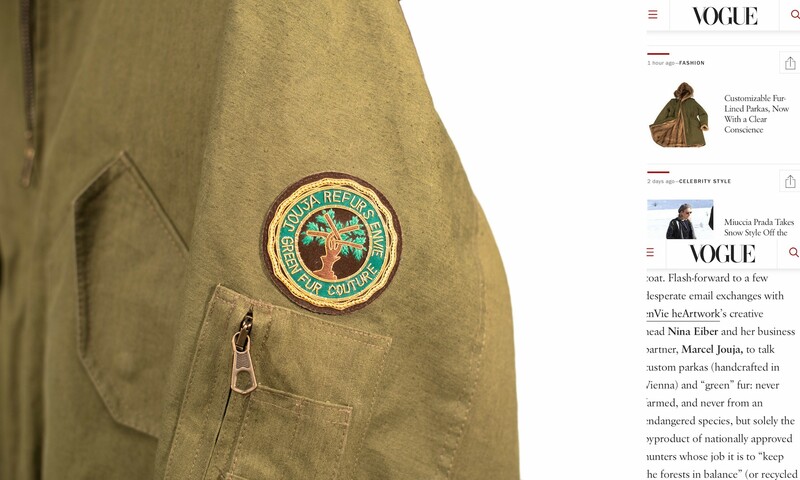 It was all utilitarian military chic, a loved-up, lived-in army green with an authentic-looking sewn-on patch that I didn’t quite recognize, generously hooded and completely lined in chocolatey, rich mink. “Excuse me,” I said, interrupting someone else’s praise of the Dyson DC59 (also, my friends, a great vacuum), as we detangled our two dogs, “But where did you get that coat?” Her friend designed it, back in Austria, she said, leashing her pup. It’s recycled fur, a cool project, it’s reversible, too. Really warm. “What was your friend’s name?” I said, and here is where I might have barred the exit with my arm, if I could have, because I was really feeling thatmenacingly needy of this particular coat. 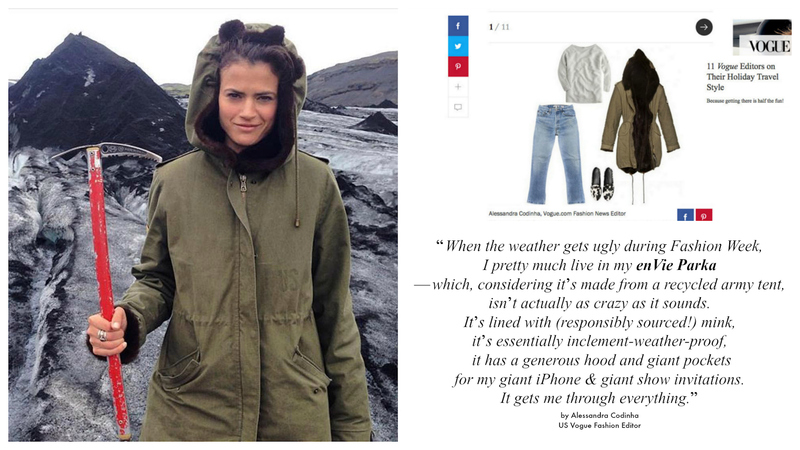 Flash-forward to a few desperate email exchanges with enVie heArtwork’s creative head Nina Eiber and her business partner, Marcel Jouja, to talk custom parkas (handcrafted in Vienna) and “green” fur: never farmed, and never from an endangered species, but solely the byproduct of nationally approved hunters whose job it is to “keep the forests in balance” (or recycled fur coats), according to their website. Fur is durable, they explained, fur can be worn over generations. Fur is also, I pointed out, very warm. (And yes, sure, so is a clear conscience.) But the best part? 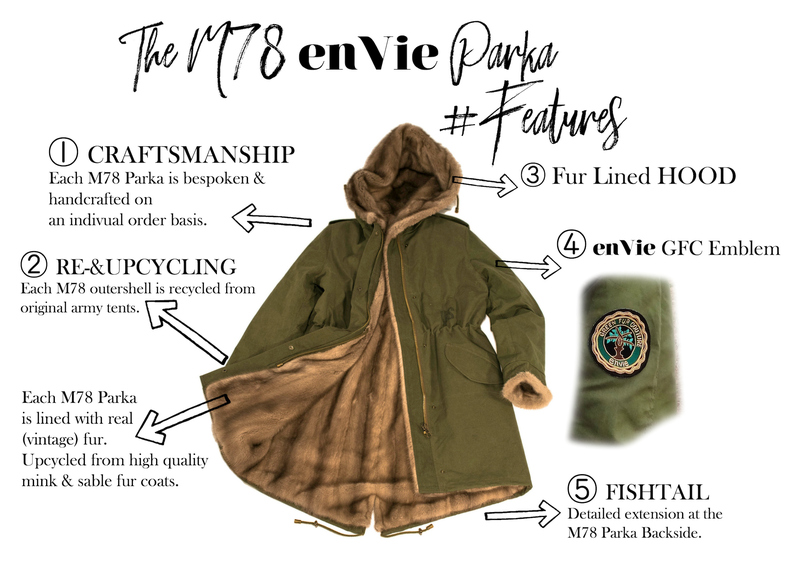 You can also customize a coat, from its cut to the desired wear of recycled military tent that makes its outer shell to the shade of mink that lines it. It is, my friends, decidedly not made to blend in. And hey, neither are we.